Good morning. You can tell it's morning because the sun just rose from the East. Did you see it? Of course you did - you were praying that direction when it happened. I'm sure many of our Muslim readers thought after reading Friday's Holy Day edition that you would never see another Good Morning column again, but you were wrong. As wrong as those who years ago doubted the Reverend Martin Luther King Jr. and as wrong as the people today who doubt Barack Obama's qualifications to be President. This is the week of January 19th, 2009 but it feels like we're already in February for Black History Month. 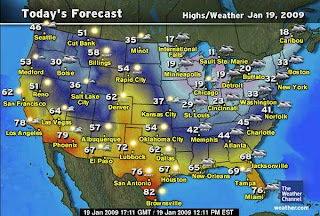 As you can see, things have gotten much better for those of us in the Upper Midwest and Northeast since we last talked. We're still not out of the woods yet, nor do we have woods anymore - last week's Arctic air killed off all remaining tress in the region. Those of you along the southern edges of the United States should have very pleasant weather to enjoy your day off or your National Day of Service. Notice how Cut Bank, Montana will be unseasonably warm. At 60 degrees, roughly 3000 Cut Bankers should enjoy this weather (and their right to own a gun) while it lasts. Martin Luther King Day first became a national holiday in 1986, after being signed into law three years earlier by civil rights icon and Republican President Ronald Reagan. Today, like all third Mondays in January, we will recognize the achievements of Dr/Rev King. King was actually born on January 15th, 1929, the year of the last worldwide economic depression to match our current one. King spent his life pushing for the equality of all peoples and was actually gone after when he spoke out on Vietnam1. The most interesting thing about Martin Luther King Jr. Day was the reluctance of states, people and certain video game companies to observe it. The NFL boycotted2 hosting Super Bowl 27 in Arizona because that dry, evil state refused to recognize MLK Day as an official holiday. Even worse, Virginia used to call the third Monday in January the Lee-Jackson-King day3 until the post 9-11 recession depleted the state's irony reserves and the holidays were split into two: Lee-Jackson Day for racists rebels and MLK Day for humans. In the spirit of Martin Luther King Day, the Obama campaign/transition team/regime has set up a website - USA Service.org - where people can look for service opportunities in the community. I think this is a really cool idea and it's actually been going on all weekend. On Saturday I helped organize clothing donations at the Rainbow House, on Sunday I watched Rear Window for the first time and today I plan to give blood at the Red Cross. Yes, the same Red Cross that prevents homosexuals and HIV victims from donating blood. Before you yell, let me make two points. First, they've actually been doing a lot to help out people in America's torture chambers around the world, such as Guantanamo Bay. And tomorrow, for one day only, they won't be screening out any donors. As long as you come in with a smile on your face and pledge your allegiance to Barack Obama your blood will be welcomed and distributed into the blood supply with no questions asked. I implore everyone to make today special by celebrating Dr/Rev King's life by doing something good, however you may define it. This, of course, does not apply to members of the Bush administration who have been sadistically defining immoral acts as moral for eight years. Hey fuckers, it's your last day in power so please have fun! 1Machine, Rage Against the. "Wake Up" from Rage Against the Machine. 1992, Sony Records. 2West, Cornell. 40 Yards and a Mule: Arizona's Complicated Relationship with the NFL and Race. Random House, 1992. 3Devine, P. G., & Sherman, S. J. (1996). "JTT Visits Virginia." Tiger Beat, 153-159.
i believe our once-upon-a-time weed guy was named after the author of footnote #2.
also, notice how there's a town called 'brownsville' right on the mexico/america border? texas is so racist...geez. Good morning, Glenn. Have fun donating blood. Good job on referencing Rage Against the Machine. What a great scholar you are. What a great way to wake up in the morning. As a person who doesn't drink coffee, I'm not usually jolted awake or expel my bowels immediately. Thanks to this article I did both. I love praying to the east, Rear Window, and Cornell West. And I LOVE Good Morning from OYIT!!! I read in a Turkish blog somewhere that the Red Cross was really a front organization set up to steal blood for the consumption of Jewish Vampires. So, watch out.